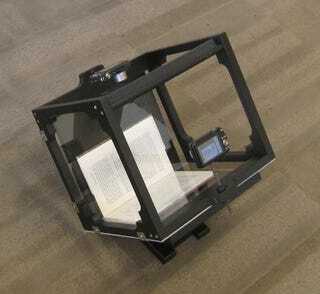 The BookLiberator Project is kit of open source hardware and software, designed to help you digitize your personal library without damaging your collection. It won't spare you from having to turn each page, but it is some seriously clever design. The process works by photographing each page, two at a time, via two simple point and shoot cameras attached to the BookLiberator frame. You'll have to supply the cameras yourself unless you want to buy them from BookLiberator, but the frame streamlines the process immensely by insuring that the pages will be lined up in each shot. From here, the accompanying software scans the photographed pages and converts them into organized text, spitting out a digitized ebook in a variety of formats. The only caveat is that you'll still need to pick up the frame and turn each page manually, so consider stretching out before tackling the digitization of War and Peace. We've covered book scanning technology before, but this method looks like it could hit a sweet spot between cost, convenience, and simplicity (or lack thereof).